“Pro-focused” is correctly put in quotes. Some people who think of themselves as pros would be convinced that such as Mac is a pro Apple computer. I wanted to stop this post before it fully posted. “Pro-focused” is correctly put in quotes. Some people who think of themselves as pros would be convinced that such an Apple Mac is a pro Apple computer. Thanks for demonstrating the gamma loser mentality, no one cares what you think, repeating the same thing in multiple posts reinforces the fact and is utterly repulsive. Actually, this is the Mini I’ve been waiting for. I’ve got an i7 on the way. CPU-based tasks are on par with anything out there and I’ll be happy to add an eGPU and have a iMac Pro-like setup for 50% of the cost. Since I already have a TB2 raid and monitor, this should be up and running in no time. Plenty of pro work will get done. So why not make the Mac mini package just big enough to have the option of a discrete GPU? It would still be a very small desktop, yet true pros could customize it for their workflow and semi-pros and amateurs could customize it for their budgets. To state the question a bit differently, why not offer a true headless iMac, with most of the GPU/HD/SSD options available from the iMac 21″ & 27 & Pro” lineup? If I buy an iMac, I can go from a 1TB/3TB Fusion drive to a 2TB SSD. From an Intel Iris Plus Graphics 640 to a Radeon Pro 580 with 8GB. From a 4 core to an 8 core CPU. 1. someone who just wants a basic multi-media computer for his home entertainment/surround sound system—big Fusion HD for storing all their pic, movies, & music. 3. the mega corporation which is setting up a server/render farm—some need discrete GPUs, some don’t, often don’t need large SSDs and don’t want Fusion HDs. 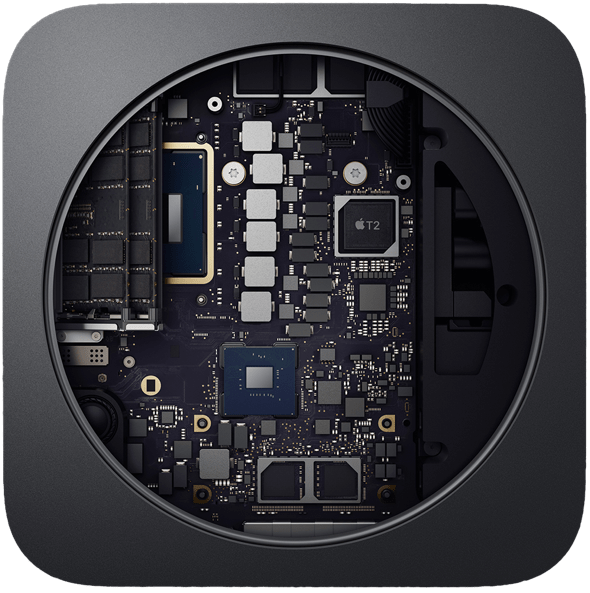 Since the FCPX crowd is important to Apple, AND because Apple has indicated that the Mac Pro will be “modular”, I believe that if you take what you describe, and put some thunderbolt three connections in between the modules, you’ll have a good description of what the modular Mac Pro will be. A mini with more graphical capabilities. I believe Ram may be upgradable, but still assuming that all other “upgrades“ would be via sealed modules. Here’s the thing: the new Mac Mini comes with no discrete graphics and you’re comparing with iMac Pro with at least a Radeon Vega 56 in it for GPU intensive tasks. That’s not exactly fair. What would be more fair is to compare Mac Mini with e-GPU against iMac Pro. Base iMac Pro with 8 cores and Vega 56 is $5K, which includes a 5K display, keyboard and mouse and 32GB RAM standard. So let’s take a $1500 Mac Mini with 10gbe, 512gb, 8gb ram, i7 cpu, and let’s say 32gb of ram after market costs $200, Vega 56 $350, keyboard/mouse $250, 5K LG display $1300. $1500+200+350+250+1300 = $3600. For $1400 less, you get 2 fewer cores, a separate 5K display you can reuse later, an EGPU you can upgrade later if you want, and RAM you can still expand to 64gb later. Now let’s re-run the tests and see how close the performance gets.